Traditional music performance by Kolintang Suara Cendrawasih, a kolintang group, gives an authentic music performance to Asian Fest visitors in Kaka Zone, Gelora Bung Karno (GBK), Senayan, Central Jakarta.
" Thumbs up for them, because their songs really represents Indonesia"
Besides playing national songs such as Berkibarlah Benderaku and Dari Sabang Sampai Merauke, this group plays folk songs such as Bengawan Solo, Si Patokaan, Kebile-Bile, Prau Layar, Janger, and Ondel-ondel. Moreover, they also play several foreign songs such as El Bimbo, Pepito, Bossa, and Quisaz. This group which members are mostly women attracts visitors and supporters on the location. Kolintang Suara Cendrawasih Coordinator, Ayu Citawati explained, her side mostly plays national and folk songs to promote and preserve Indonesian cultures. "We need to be proud as Indonesian," she affirmed, Monday (8/27). Meanwhile, Haikal (23) as one of Asian Fest visitor admitted to be entertained with Kolintang Suara Cendrawasih with its traditional music performance. "Thumbs up for them, because their songs really represents Indonesia. 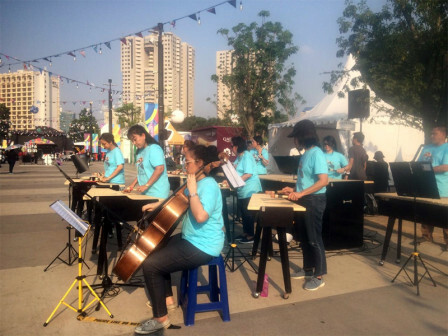 They are women, but they are quite strong to play tens songs without much rest," he stated.